Click small photo to view it larger. 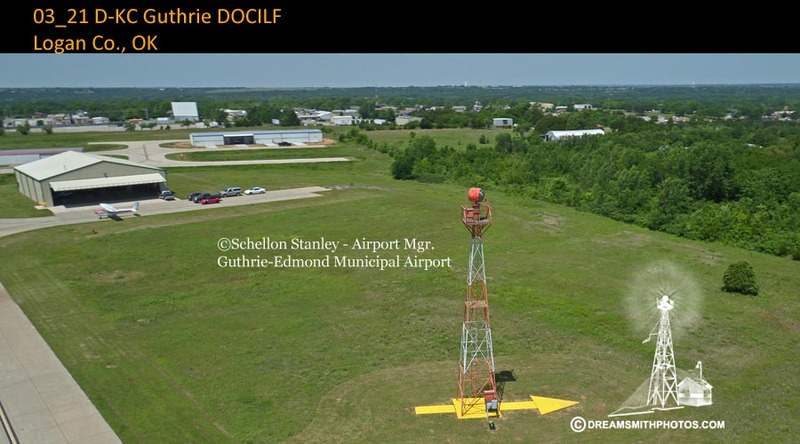 Guthrie, Okla. (Route D-KC, site 24)—The beacon site at Guthrie has been relocated to a point, 2 miles south of that city and changed to an intermediate landing field in the N. ½ sec. 21, Tp. 16 N., R. 2 W., Logan County. This new field is L-shaped. Landing strips are 2,000 feet east and west and 1,850 feet north and south. A 50-foot ground marker has been installed at the intersection of the landing strips and the farm land portions seeded. The entire area is now in satisfactory landing condition. 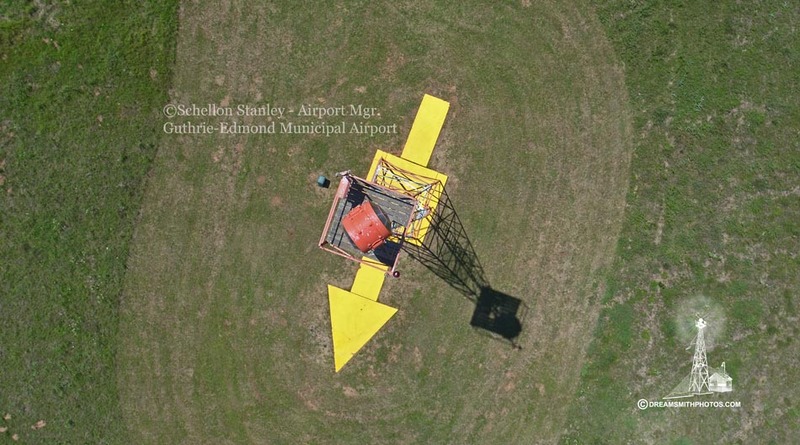 A 24-inch beacon, 2,000,000 candlepower, 6 revolutions per minute, is mounted on a 50-foot tower in the northwest corner of the north-south runway. Green course lights have been or will be installed. There is a directional arrow at base of tower. GUTHRIE, OKLA. Name: Site 24, Dallas-Kansas City Airway (D-KC). Class: Intermediate. Rating. Owner and operator, Dept. of Commerce. Position: Lat. 35° 50' 06"", long. 97° 23' 15""; alt. above sea level, 980'; mag. var., 9° 45' E., 1930; annual decrease, 1'. Distance and direction from city, 2 miles S. of center. Description: Size, see sketch; acres, 53; shape, L. Surface, sod; gradient, rolling; drainage, natural. landing strips, two, 1,930' x 630' and 1,850' x 670'; entire field available. Marking thereof, none. Obstructions: Trees, power line, and beacon tower to NW. ; trees to N., NE., and SB. ; fill to S.; fence surrounds field. Marking (day), tower striped yellow and black; shed yellow with black band. Lighting, red on pole line and marking obstructions to NE. and S.
Marking and identification: Standard 50' white circle, with arms, at intersection of landing strips. Name on hangar or in field, none. Other marking, 24 D-KC on shed roof. Wind-direction indicator, illuminated cone on tower. 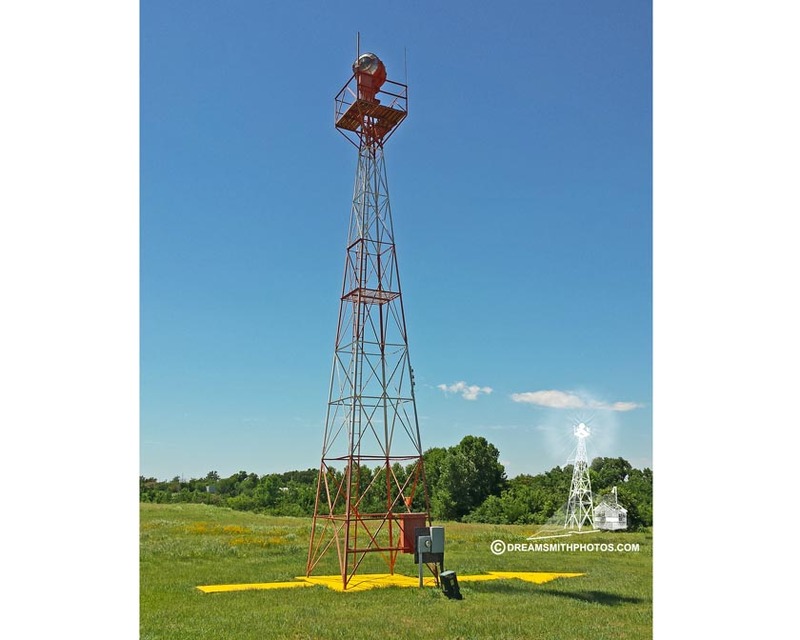 Lighting: Beacon, 24"" rotating, 6 r. p. m., 2,000,000 c. p., on beacon, operated from dusk to dawn. Boundary lights, surround field. Approach lights, green, indicating best approaches. Flood lights for landing, none. Other lighting, 2 amber course lights pointing to beacons on airway. Accommodations: Personnel for servicing, none. Landing fee, none; storage, none. Hangars, none. Repair facilities, none; spares, none. Specification fuel and oil, none. Guard, none; fire apparatus, hand extinguishers, Quarters, in city; meals, in city. Transportation to city, none. First aid, none. Mooring mast, none. Communication and signal equipment: Telephone, none; telegraph, none. Radio, none. Register for noting arrival and departure of aircraft, yes. Remarks: GUTHRIE on roof of building in city. Guthrie.—Department of Commerce intermediate field, site 21, Fort Worth-Wichita Airway; 2 miles S. of city. Altitude, 980 feet; L-shape, 53 acres; surface, sod, rolling, natural drainage; two landing strips, 1,930 by 630 feet, 1,850 by 670 feet; entire field available. Directional arrow marked "21, Ft. W.-W." Trees, pole line, and beacon tower to NW., trees to N., NE., and SE., fill to S. Beacon, boundary, approach and obstruction lights. Beacon, 24-inch rotating. No servicing facilities. Guthrie.—Department of Commerce Intermediate field, site 21, Fort Worth-Wichita Airway; 2 miles S. of city. Altitude, 980 feet; L shape, 53 acres; surface, sod, rolling, natural drainage; two landing strips, 2,080 by 648 feet, 1,850 by 670 feet; entire field available. Directional arrow marked "21, Ft. W.-W." Trees, pole line, and beacon tower to NW., trees to N., NE., and SE., fill to S. Beacon, boundary, approach and obstruction lights. Beacon, 24-inch rotating. No servicing facilities.